Obesity is a growing epidemic, specifically in the age demographic of college students. One of the largest factors causing obesity is how frequently people choose to eat something convenient, such as fast food. Problem: College students are busy. Whether they are pulling all nighters for their 8:00 a.m. test, participating in intramurals, working, or getting together with friends, cooking a meal at home does not present itself as a convenience. The on-the-go college student has a tough time balancing their health, social activities, and budget and desperately need a solution. 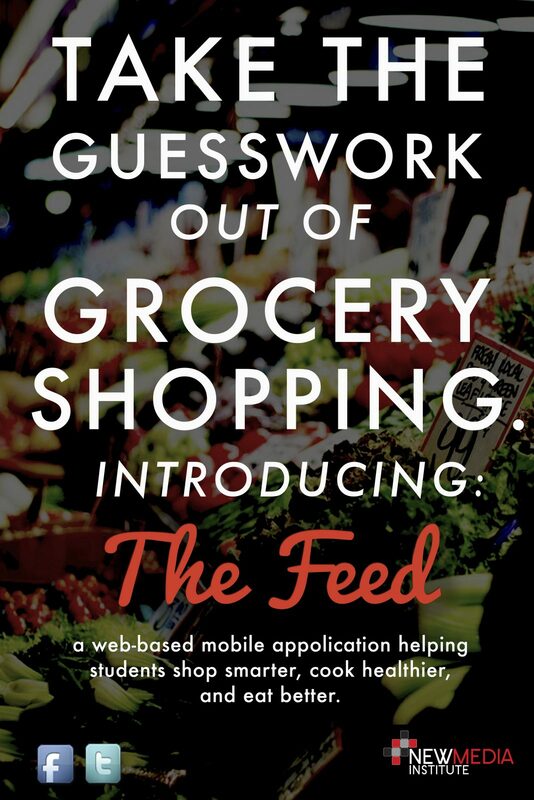 The Feed is a web application created by college students for college students. Nothing in the fridge? Tight budget? Friends always eat out? We’ve been there. It’s hard to be social, save money, and eat healthier, but we can help. With The Feed, it is easy to get friends together to share recipies and enjoy a delicious, healthy meal without breaking the bank! The Feed works to entice students to choose appetizing meals through an appealing interface that focuses on photos in a scrolling feed. Websites and apps like Pinterest, Instagram, and Tumblr have made this format popular and are easy to understand for The Feed’s target. The Feed’s goal is to construct empowered college men and women who will know they are capable of creating appetizing meals at a low cost while still being able to socialize with friends. By cooking meals at home, college students will become more nutritionally conscious, leading to longer, healthier lives. Through integrating this application into students’ weekly routines they will subconsciously learn healthy eating habits while enjoying the pride in cooking for themselves and friends at home.